PEKO partnered with a medium sized OEM company who produces a highly precise piece of industrial equipment, predominately for customers in the semi-conductor industry. The company had become overly reliant on a single supplier and associated assembly, which accounted for a large portion of their product. 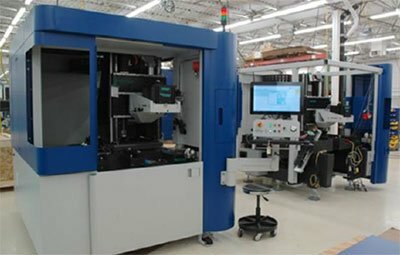 This OEM needed to control their own destiny, by developing a new machine platform independent from that supplier. PEKO’s combination of broad engineering experience and complete production manufacturing capability, while allowing the customer to maintain complete ownership of their product was the perfect match. While the customer possessed the technical expertise for their propriety process, PEKO was tasked with developing the product’s platform which could accommodate all critical parameters on a nano-level for their process to operate successfully. Material selection, precise motion controls, FEAs, and extensive GDT are just a few of the key aspects of the design that were completed by PEKO, while meeting stringent cost constraints. Sub-assembly prototypes were designed, built, and tested in-house to verify designs, prior to final integration into the complete machine. Our strong partnership with the customer in addition to our internal resources, allowed for a collaborative debugging process to address all issues in a timely manner. The completed machine was displayed on tradeshows and began to ship direct to customers. A cost effective fabrication and assembly process at PEKO has been developed to accommodate both parties and meet the increasing market demands for this equipment. Due to the successful partnership and product development on the initial machine’s design and fabrication, this long term relationship extended to a second generation of equipment. This next level machine provides the same propriety process as the original, on a larger scale with additional advanced features. The market for a larger scale machine expanded due to the successful launch of the first PEKO designed machine. During our relationship, this customer has been acquired by a world leading supplier for the semiconductor industry.